A tutorial for Qt Quick based on an alarms application. 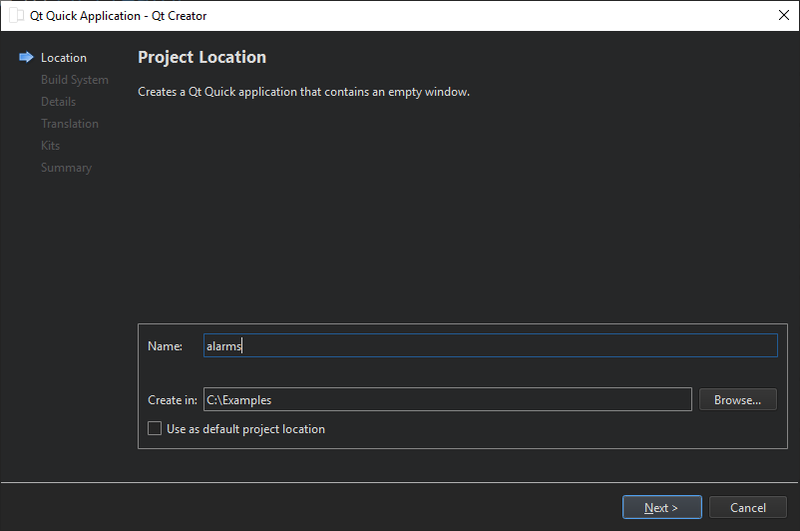 This tutorial shows how to develop a simple alarm application as an introduction to Qt Quick and Qt Quick Controls2. This application is similar to the alarm application usually found on an Android phone. Its features let you enter, edit, or delete alarms. An alarm can trigger on a given date, and you can set it to repeat on a series of subsequent days. The source files are located in the qtdoc repository. You can either fetch the Qt 5 sources from the Qt Project, or install them as part of Qt 5. The application is also available in the example list of Qt Creator's Welcome mode. This section shows how to create the project in Qt Creator. It discusses the files generated automatically by Qt Creator, and the two files the programmer has to create in Qt Creator or some other editor. The latter two files are included with the source code for this tutorial. To create the Alarms project, select File > New File or Project > Application > Qt Quick Application - Empty > Choose. Type "alarms" in the Name field, and follow the instructions of the wizard. main.cpp The main C++ code file for the application. qml.qrc The resource file, which contains the names of the source files, except main.cpp and the project file. The wizard generates the code in the main.cpp file below. This code block enables High DPI scaling and declares app and engine. The engine then loads our main QML file. qtquickcontrols2.conf Selects the Material style with the Dark theme. AlarmDialog.qml Defines the dialog for adding new alarms. AlarmDelegate.qml Defines the layout of the main screen of the app. AlarmModel.qml Defines the ListModel used for storing the alarms' data. mainWindow, an ApplicationWindow QML type, is the root item in this app. The ListView alarmListView combines the data from alarmModel with the layout defined in alarmDelegate. 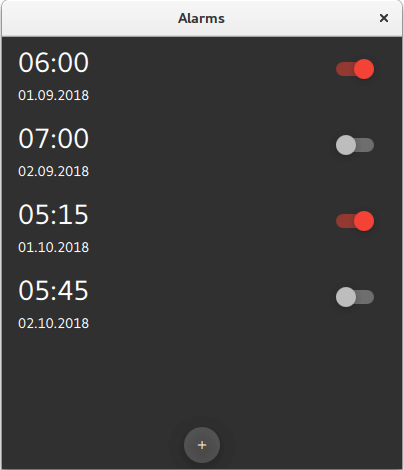 New alarms can be added by clicking RoundButton addAlarmButton. Clicking it opens a dialog screen alarmDialog. This dialog screen has a RowLayout with a Tumbler each for hours and minutes, and another RowLayout with a Tumbler each for day, month, and year. Each alarm in the main screen is an ItemDelegate. The ItemDelegate root contains all fields on the main screen and the detail screen. The detail screen's fields are only visible after an alarm has been clicked on, i.e. when root.checked is true. Material.background: checked ? Material.accent : "transparent"
This QML file contains the definition of alarmModel, the ListModel that manages the alarm data. It creates five ListElements with example alarms. // Populate the model with some sample data. TumblerDelegate defines the graphical properties of the Tumblers. At the bottom of the startup screen, you can see a Button for adding alarms. Click it to open the Add new alarm dialog. All fields are entered using Tumbler QML types. If you press OK, the values selected in the Tumblers are written to alarmModel. 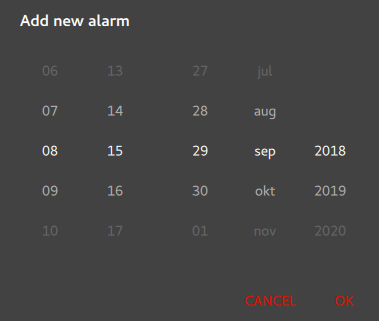 If you click on a particular alarm, you can edit it in the detail screen. Clicking on an alarm sets root.checked to true, which makes visible the fields of the detail screen. If you want the alarm to trigger also on other days, check alarmRepeat. The Repeater will display a checkable RoundButton for each day of the week. 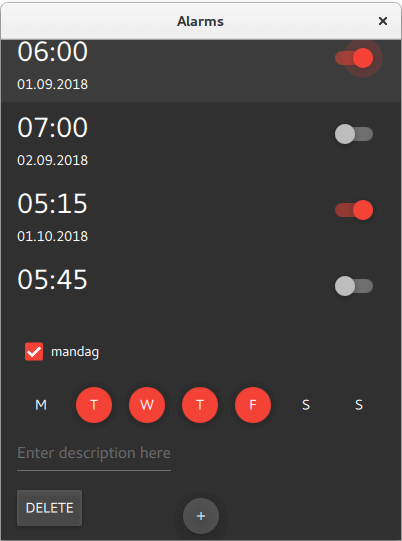 If you modify the description of the alarm, it will be reflected in the main screen afterwards. The detail screen (see above) has a Button for deleting alarms. When onClicked is emitted, the current ListElement is deleted from alarmModel. The app has no code for adding sound or vibration to the alarm, nor does it store the alarms in any format or database. Maybe it could be an interesting coding project to add those features. Adding sound to this program can be realized with Qt Multimedia QML Types. Storing the data could be done quickly and easily in JSON format. See also Qt Multimedia QML Types and JSON Support in Qt.